The IPCC is likely to say that even the most optimistic scenario for climate change isn’t great at all. The leading international body of climate change researchers is preparing to release a major report Sunday night on the impacts of global warming and what it would take to cap warming at 1.5 degrees Celsius, or 2.7 degrees Fahrenheit, above preindustrial levels, a goal that looks increasingly unlikely. The report is from the Intergovernmental Panel on Climate Change, an international consortium of hundreds of climate researchers convened by the United Nations. Authors are meeting this week in Incheon, South Korea, to finalize their findings, but Climate Home News obtained an early leaked draft. Why examine the prospects for limiting global warming to 1.5°C? 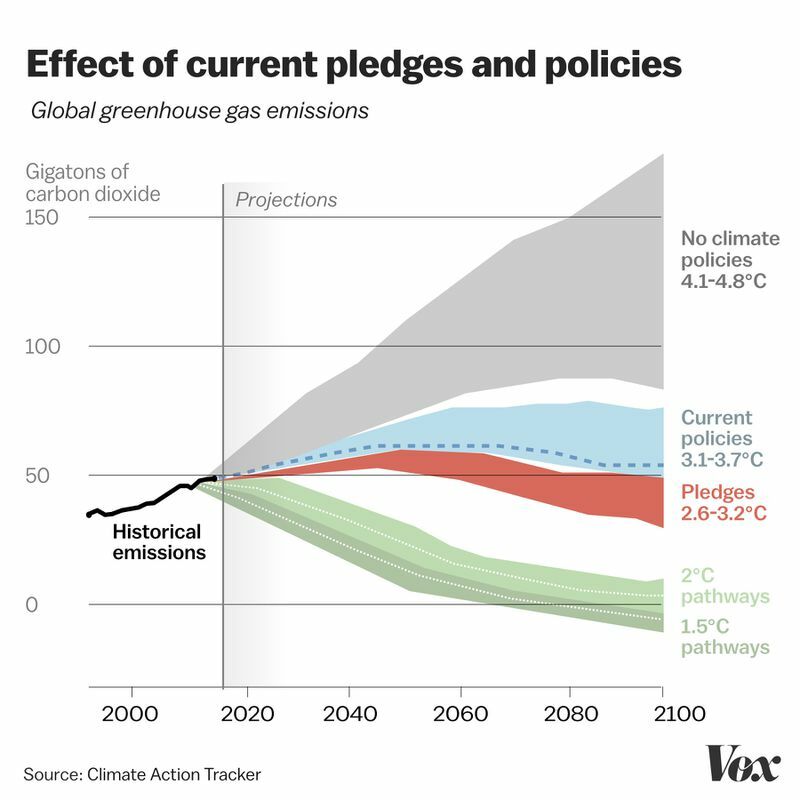 Because under the Paris agreement, countries agreed that the goal should be to limit warming to below 2°C by 2100, with a nice-to-have target of capping warming at 1.5°C. According to the drafts, the report finds that it would take a massive global effort, far more aggressive than any we’ve seen to date, to keep warming in line with 1.5°C — in part because we are already en route to 3°C of warming. And even if we hit the 1.5°C goal, the planet will still face massive, devastating changes. So it’s pretty grim. But this is also a thunderous call to action, laying out what tools we have at our disposal (we have plenty) to mitigate global warming and to accelerate the turn toward cleaner energy. Let’s walk through the basics. The planet has already warmed by 1°C due to human activity, and we’re seeing its consequences right now: Sea levels have risen more than 8 inches since 1880, we’re witnessing the fastest decline in Arctic sea ice in 1,500 years, and extreme weather events are becoming more damaging due to climate change — to name a few. However, it could get worse if the world got even hotter. And right now, we’re likely to soar past 1.5°C as early as 2030 and hit 3ºC by 2100. That’s why, as my colleague David Roberts explained, 2°C of warming is way worse than 1.5°C. It would increase sea levels by another 4 inches (10 centimeters) on average. It would knock down global wheat production by 7 percent. It would increase the intensity of severe rainfall events by 2 percent. All this adds up to a compelling moral and economic case for reaching a more ambitious climate change mitigation goal. Limiting global warming to 1.5°C is going to be really, really hard. But we have to go for it. Right now, though, only a handful of countries are on track to meet their targets set under the Paris agreement — targets, remember, that they set for themselves. Global greenhouse gas emissions are still increasing, and even climate change-fighting champions like Germany are on track to miss their goalposts. Yet if every country were to meet its goals under Paris, that would still put the planet on a trajectory to warm by 3°C. Hitting the far more ambitious 1.5°C target is therefore a much heavier lift, in terms of politics, economics, and technology. Climate change campaigners have compared the endeavor to fighting a world war. It would require replacing the bulk of the world’s fossil fuel generators with cleaner alternatives. It would drive the world to electrify everything. Planners would need to redesign cities to allow cleaner transportation. And governments would have to pay for their emissions at a price high enough to include the social costs of carbon. The grimmest prognosis in the draft report is in the details of the effort it would take to actually limit warming to 1.5°C. Countries won’t just have to give up fossil fuels and stop emitting greenhouse gases; they’ll have to pull carbon dioxide straight out of the air. “All mitigation pathways compatible with limiting global warming to 1.5°C by 2100 involve removal of CO2 from the atmosphere,” according to the draft. 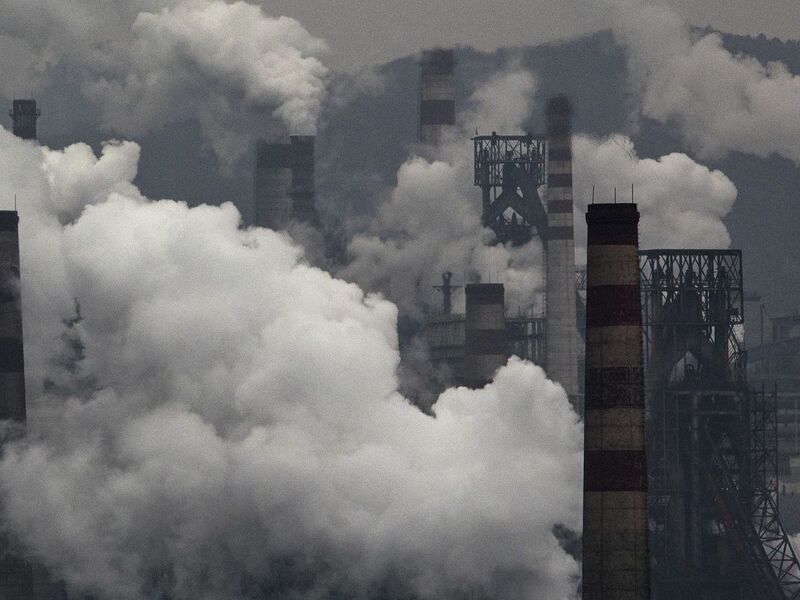 And not by a little, but by a lot, upward of 180 gigatons of carbon dioxide by the end of the century. This will require machines that scrub carbon dioxide out of the air as well as biofuels coupled with carbon capture and sequestration. These tactics have their own energy demands and environmental drawbacks, and we may not be able to deploy them in time. “There is a high chance that the levels of CO2 removal implied in the scenarios might not be feasible due the required scale and speed of deployment required and trade-offs with sustainable development objectives,” according to the leaked report. Countries will also have to make drastic changes to land use practices. Some of the warming that’s baked in will also force millions to retreat from coastlines. “Sea level will continue to rise for centuries,” according to the report. We also don’t have much time to act. Because it takes decades for a buildup of carbon dioxide to influence the planet’s temperature, a 1.5°C warming trajectory demands cutting the planet’s emissions 40 percent by 2030. The longer we wait, the more radical our options. The IPCC authors insist this report is not a political document, but it’s hard to avoid the political subtext. We’ve known the scale of the challenge for some time, but seeing it all combined in one place is staggering, and that’s part of the point of this exercise. Some of the language in the report could change by the final version to be released next week, but the facts of the report aren’t new. Though many public officials have historically shrugged off dire forecasts of our planet’s future, the upcoming report closes off the temptations of wishful thinking, that humanity will somehow limit its emissions on its own or that we can develop technology to offset all our problems. It shows that even in the best-case, most optimistic scenario, hard decisions lie ahead. Trump slashed refugee levels this year. For 2019, he’s slashing them even further. AMC’s Lodge 49 is an impossible TV show to describe. I love it.